What an amazing seated dinner reception. I think most daughters would say their moms were influential if not the most influential people in their lives. They give everything they have to give you the best they can offer and then some. Its interesting being a mother now of two soon to be four young children and think about what she, my mom, must have been feeling and thinking taking care of my two brothers and I. I think the older I get the more I want to do things the way she did them and you appreciate the sacrifices, which at the time you didn’t know they were sacrifices, that she made. She battled cancer beginning when I was in high school. That first experience with cancer really charged her to try new things. She decided to enroll with her sister in NYU’s Appraisal Studies in Fine and Decorative Arts over the summer after her recovery. I loved hearing their stories of two ‘Southern Ladies’ living in dorms in the West Village. I don’t think their professors or classmates knew just what to expect from them but I think they were probably pleasantly surprised. Mom made the most of that experience and this launched her to do appraisal and personal antique and fine art shopping back in Alabama. I loved traveling to auctions with her and driving to frequent business shopping trips to Atlanta. We made some memories driving filled Uhauls for hours back home in the dark after auctions. Mom was the reason that I headed to New York City after graduating college. She knew that experience would be good for me just like it had been for her. I moved up at the end of August in 2001 without a job and just 2 weeks before 9/11. By the true grace of God, I found a job working for a medium size architecture office in Chelsea and most significantly sat next to my future husband. That was a great job; working for a boss that really let me so be involved especially with clients even though I had little experience. Working for Bunny Williams was truly an opportunity of a lifetime as well and it was so fun talking to Mom at the end of a day and telling her some of the amazing things I had experienced. When I got engaged she flew up to New York to help me find my wedding dress. We made a full day of it, first browsing at Bergdorf Goodman, then Saks and then hopping on a subway headed to Queens where we found THE dress at Kleinfeld. She flew up to visit me many times and we always had a lot of fun. One visit her best friend came along and we drove around Connecticut antiquing and enjoying the sites of another beautiful part of the country. Of course when Jim and I decided to take an opportunity and move to Asia there were mixed emotions but Mom and Dad always supported us. They came to visit us after we had been there maybe a year and we had a trip of a lifetime through China, Vietnam, and Thailand. Just like in New York, mom and I would spend hours chatting on Skype and I would tell her about our recent trips and finds. She was my biggest fan. When our second daughter was born I named her after mom, Mary. Its amazing how God works. That little girl looks just like mom and she is so funny and on the days that I miss Mom, which is everyday, I have my own little Mary to make me smile. I’ve had it in my mind to try and put together a tribute to Mom but its an impossible task, how can you sum her up in words, you can’t but everyone should know that I had an amazing mom. She was beautiful, a talented interior designer ( even though she would never call herself that), the best listener and cheerleader, not selfish, gentle and fiery, thoughtful of others, the most gracious hostess, a loving wife, an amazing flower arranger, a wonderful grandmother and the best mom I could have ever asked for. Unintentionally I’ve been collecting dragons since we moved here 7 years ago. I truly realized this a few days ago when my oldest daughter started talking about going to the dragon dance. 2012 is the year of the Dragon and today is the 1st day of the Chinese New Year. 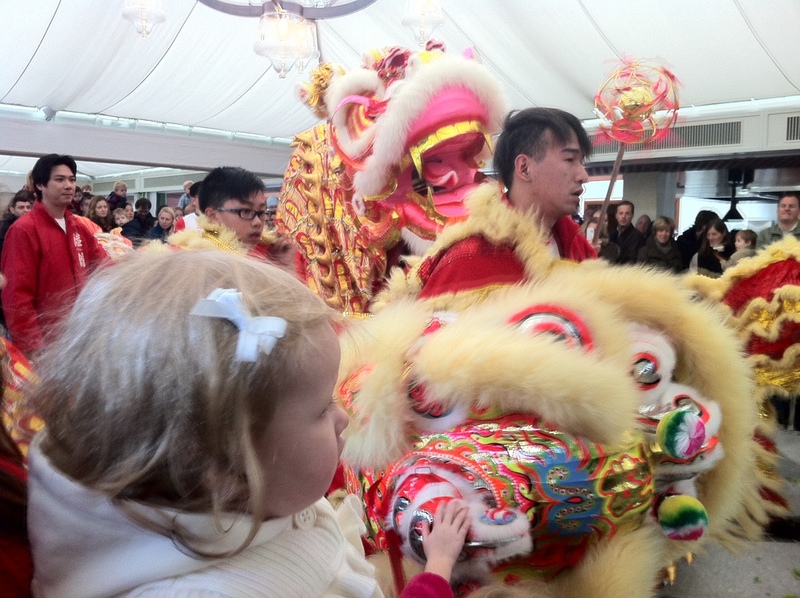 Today we did see a dragon dance and it was a lot of fun. Take a peek of some of our dragons! I quick shot from today. What a treat, the kids loved it. 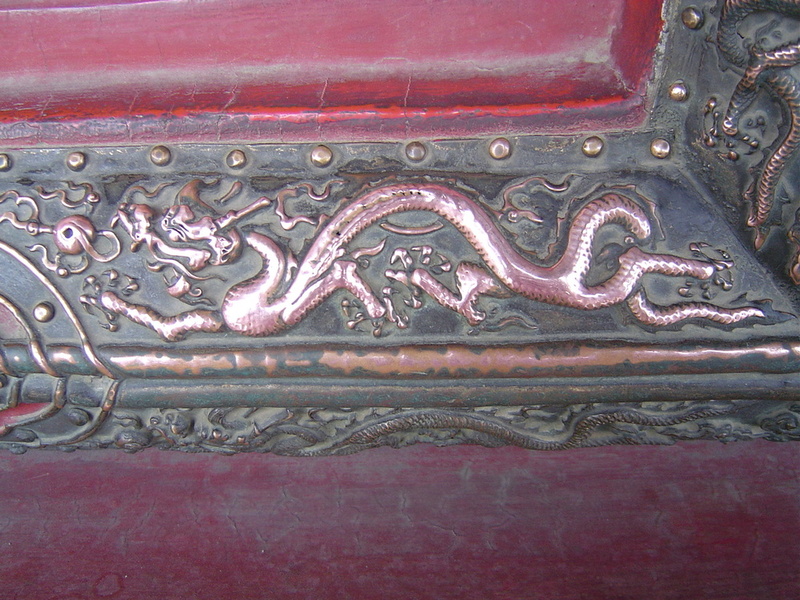 Dragon Etched on Playful Brass Shoe Ashtrays from the 1950’s. I like to use these for small flower arrangements. Soda Water at an amazing thatched roof restaurant in Phuket, Thailand. Is this a dragon or a dog? I love this picture, and I want to go back there! just wanted to share some cute pictures from Mary’s 1st birthday. We had close friends over for a birthday barbeque. Anna Grace loved posing in her apron before the party. For this party I had a very talented cake designer, Elizabeth Badrinath of Cakeworks Hand Sculpted Cakes make the cupcakes. They were gorgeous and delicious. Check her out; she’s so creative and can make anything. Click here and you’ll see what I mean! This is a happy birthday girl! I love designing pillows; it may be may favorite thing to design for a home, next to selecting and pairing plates, linens, flowers,and stemware for a party. Pillows are the sort of thing that can totally change the look of a room on their own. Well, its not cold here in Hong Kong but I’m in love with the cut velvets I’ve used in this most recent collection of pillows. Take a look or better yet, come and feel them Tuesday, November 8th at the AWA’s Annual Charity Bazaar at the Happy Valley Racecourse on the 5th floor, table 506 near the Special Events Stage. If you can’t make it or you’re just not sure whether the color works for you no problem, we have fabric swatches! Just send us your address and we’ll pop some fabric samples in the mail! For those of you in the U.S. I will be bringing some stock over to the States first of December. Let me know what you like and I’ll bring them back for free U.S. domestic shipping! These are so soft! Red, White and Blue! Surprise, surprise, these are her favorite! I also like the solid color napkins for parties and the holidays. These are also available in a smaller cocktail size. Ok, these aren’t white but they’re another item that keeps me going back to Ikea for more! So, I’ve bitten off more than I can chew! I bought a set of 6 dining chairs from a very popular classifieds website here in Hong Kong. www.hongkong.asiaexpat.com They were an absolute deal and the style was great BUT they were painted GOLD!! My plan was to strip them and then paint them off-white. I’ve also considered painting them a piano black finish, which is my husband’s vote. I’ve only stripped 2 of the 6, which was not as easy as I had hoped. It looks like the wood is possibly mahogany which was a nice surprise. So I guess the third option would be to stain them. What do you think? Maybe I should take a vote: Off-white, Piano black, or a dark stain? Once the gold paint is COMPLETELY removed and they have been refinished they will need new seats and seat back. I think I’ll let someone else tackle that part. The next question will be what fabric to use for reupholstery. Hmmm…so many possibilities. I love the American design magazine Veranda. Click on the picture above for more from interior designer Melanie Turner. I love this dining room and the rest of the house in the cover story “Comfortable Glamour”, September 2010. The yellow contrast back fabric is so fresh yet sophisticated. Just a little punch of color. For more pictures from this Park Avenue Apartment visit http://www.ppapc.com/ This is also from Veranda, April 2011. The interior architect is Peter Pennoyer Architects and the interior designer is David Kleinberg, click on the picture to go his website. This entire apartment really inspired me on a recent project that I just completed here in Hong Kong. Can’t wait to share the photos. I love this pair of black chairs too! This is from Jennifer Smokler Interiors. Click on the picture to see more of her beautiful work.